This collection of maps provides information that can be used for humanitarian decision-making around the world, developed by the IRI and the IFRC. It also provides information on the types of early action that can be taken based on these maps. Six-Day forecasts: These maps show where heavy rainfall is expected in the next six days, and how much rainfall is expected. Three-Month Forecasts: These maps show where large or small amounts of rainfall are expected in the next three months. Past Conditions: These maps show rainfall patterns that can be expected for El Nino, La Nina, and average years. Recent Climate Trends: These maps show what the rainfall has been like for the last 100 years, and what trends exist in your location. Vulnerability Indicators: These maps show population density and child mortality rates to indicate areas of the world that might be most vulnerable to high or low rainfall amounts. Where is exceptionally heavy rainfall expected? This map shows places in the world that are forecasted to receive exceptionally heavy rainfall in the next six days relative to what is normal for their location. How does expected rainfall compare to normal rainfall for this month? This map shows places in the world that are forecasted to receive over the next six days a large percentage of the rainfall that normally falls over this entire month in their location. Where is it expected to be wetter than average? This map shows where the total rain/snow over the next six days is expected to be more or less than what is average for this time of year. How much rain is expected? This map shows the total amount of rain or snow (in mm) that is expected to fall in the next 6 days. Are the next 3 months likely to be unusually wet or dry? This map shows the likelihood that total 3-month precipitation will be unusually high or low. Are the next 3 months likely to be exceptionally wet or dry? The map shows where it is likely to be extremely wet or dry over the next three months. Extreme refers to the lowest or highest 15% of the historical record. Is it likely that unusually wet or dry conditions will end? This map shows where current wet or dry conditions will likely end over the next 3 months. Is it likely that unusually wet or dry conditions will continue? This map shows where and how likely recent wet or dry conditions will continue over the next 3 months. How Well Can We Predict Seasonal Climate? This map shows where IRI 3-month forecasts are consistently good at predicting seasonal rainfall for at least one season of the year. 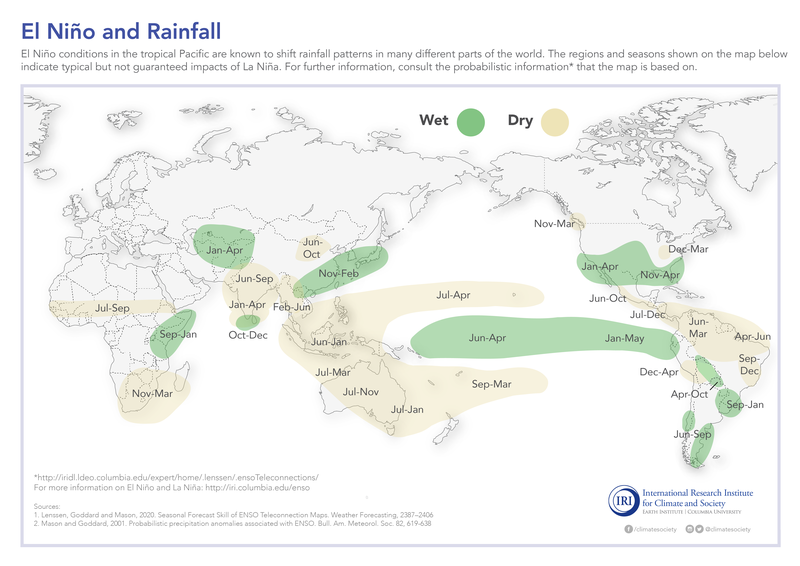 What Changes in Rainfall are Typical during El Niño? During an El Niño episode, areas in green or yellow are likely to become wetter or dryer than normal during the indicated months. What Changes in Rainfall are Typical during La Niña? During a La Niña episode, areas in green or yellow are likely to become wetter or dryer than normal during the indicated months. How much rain normally falls at this time of year? This map shows how much rain normally falls in each month of the year. You can see which places tend to be wetter or dryer than others, and which are the rainiest months for different locations. How important have century-long shifts in climate been? 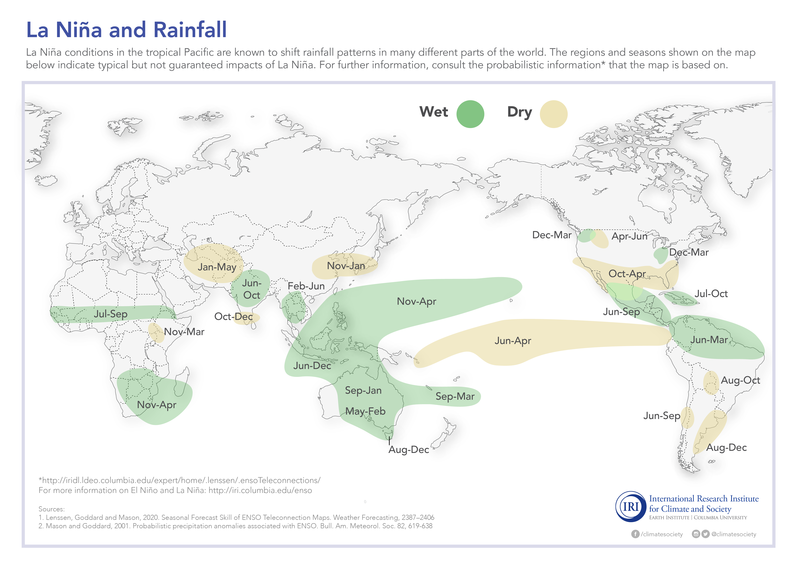 This map shows how wet and dry periods have varied over time. Draw a rectangle over a region or click a place on the map, to see graphs for that location. These graphs depict how much rainfall (or temperature) varies from year to year, decade to decade, and over the past century. This information can be used for planning purposes on different timescales, and to provide context for recent memories of rainfall patterns or specific events in a longer-term perspective. How important have decade-long shifts in climate been? How important have year-to-year shifts in climate been? Are the areas at risk of heavy rainfall densely populated? This map shows human population density. Are the areas at risk of heavy rainfall inhabited by vulnerable populations? This map shows the infant mortality rate, an indicator of poverty.